Founded in 2006, XJTLU is the largest international joint venture university in China, a partnership between Xi'an Jiaotong University and the University of Liverpool. 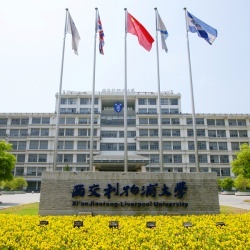 Xi’an Jiaotong-Liverpool University (XJTLU) is an international joint venture university founded by Xi’an Jiaotong University in China and the University of Liverpool in the United Kingdom. As an independent Sino-foreign cooperative university, it captures the essence of both prestigious parent universities and is the first and only one of its kind approved by the Ministry of Education in China. The University currently offers approximately 90 degree programmes in the fields of science, engineering, business, finance, architecture, urban planning, language, culture and all are taught in English except for general and basic courses. Undergraduate students earn two degrees: an XJTLU degree from the Chinese Ministry of Education and a globally recognised degree from the University of Liverpool. Postgraduate students receive a University of Liverpool degree that is recognised by the Ministry of Education. All academic departments at XJTLU offer PhD opportunities, which help to fulfill XJTLU’s vision of “becoming a research-led international university in China and a Chinese university recognised internationally for its unique features”. Located in Suzhou, a city that has been known in China as ‘paradise on the earth’ since ancient times, XJTLU enjoys a beautiful environment where there is a harmonious coexistence between the city’s rich cultural traditions and its rapid economic development. Suzhou is one of the most developed cities in China. Suzhou Industrial Park, China’s equivalent of Silicon Valley and a hub of global innovation, houses a large cluster of Fortune 500 companies, transnational enterprises and R&D centres, not only providing favourable conditions for XJTLU’s ongoing development but also numerous internship and job opportunities for XJTLU students. With a focus on the ideology of a “happy life and successful career”, XJTLU bases its values upon diversity, discipline, innovation, liberty and trust. In keeping with trends, XJTLU, by virtue of a resilient management structure and innovative educational model, is able to integrate the cultural and educational essence of the west and the east to produce world citizens with international perspectives and competitiveness. It is exploring new models for higher education that will exert a strong influence on the development of education in China and the world. XJTLU recruits the best students from China and abroad to both its undergraduate and postgraduate programmes. The University has almost 15,000 registered students, including those who are completing study at the University of Liverpool. XJTLU is committed to creating an internationalised environment in which education quality is stringently monitored and students are encouraged to manage their own lives, whilst being able to access the range of support services available at the University. At XJTLU, students are treated as young adults, which calls for them to be independent, self-motivated and cooperative. They are expected to develop into world citizens with international perspectives and competitiveness. When they graduate, XJTLU students’ ambitions and aspirations take them all over the world into jobs and further study. Of our ninth cohort of graduating undergraduate students (2018) more than 86% continued abroad for further studies (Masters and PhD), with almost 30% entering one of the world top ten universities and almost 74% percent receiving offers from universities ranking in the world top 100. Nearly 20 percent of the graduates work in Fortune 500 companies in China and the world. XJTLU upholds the same high standards as world-famous universities in hiring academic staff members. XJTLU cooperates with international head hunting companies to hire top academic talent from all over the world. It currently has almost 650 academic staff, the majority of whom hold foreign nationality. All subject staff have to hold a doctorate degree from a well-known university and have rich teaching and research experience. XJTLU offers an intellectually exciting environment in which to conduct original research, recognising the importance of both fundamental and applied study in generating new knowledge and ways of thinking. With a focus on research-led learning, inherited from two highly regarded parent institutions, the University has constructed a series of first-class research facilities. In 2009, the University was selected by the National Natural Science Foundation of China (NSFC) as a supporting unit and was chosen as a member unit of the national “863 Program” in 2012. As of the end of 2018, XJTLU has successfully applied for 260 government research projects at all levels and achieved high-level research achievements. It includes 105 national-level projects, 155 provincial and municipal level projects. At the same time, the University has carried out 65 in-depth cooperation with various institutions, including the Shuangwan Village located at Wujiang Taihu New Town, Institute of Automation at Chinese Academy of Sciences and Arts Group Co., Ltd. Since its establishment in May 2006, XJTLU has contributed to the development of higher education in China as well as developed its “Five-Star” model, through the implementation of which, it has continuously upgraded its student development system and management and operation mechanisms in response to demands. Over time, XJTLU has won wide recognition for its highly internationalised environment, advanced educational concepts and high-quality talent development. Our vision is to become a research-led international university in China and a Chinese university recognised internationally for its unique features in learning and teaching, research, social service, and education management. XJTLU has given us a precious insight into producing innovative talents in China’s higher education institutes. ​The 10-year journey from fewer than 200 staff and students to today's vibrant community of more than 10,000 has been challenging and rewarding. Operating the University requires the skills and experience of professional staff within a range of teams, departments and leadership roles. Our Board of Directors oversees the University’s governance and the senior management team leads the strategic direction and day-to-day operations. Our deans provide academic leadership for research and graduate studies, International Business School Suzhou, and learning and teaching. The XJTLU professional and administrative offices are organised into four interfaced service centres that provide support to the University’s core functions. We are a game changer in the field of higher education in China. Our transnational model is unique in the country and so is our contribution to the development of higher education.